Buying Advice: 😐 Neutral. Good Single Malt. Unfavourable P/Q ratio. Nose: The Smoke is there of course but it's quite subdued after 25 years in the cask. It's Smoked Fish/Shell Fish or even Bacon rather than Campfire Smoke. The Peat is there as well but it's more Farmyard than Coastal. Wet Clay and Straw mixed with Cow Manure to be more precise. I also find Sweet Toasted Cereals, Toast with Salted Butter, Vanilla, Toffee, light Tar, Soot and Iodine, Rubber, Tobacco, Oak, Leather, light Honey, Pineapple, Dried Fruit like Raisin, Plum and Apricot, Wet Newspaper, Wet Rocks, Sour Apples, Herbal Tea, Cinnamon, Pepper, Cloves, Grapefruit, light Licorice, Mint and a hint of Chocolate. It's a mix of Sweet, Sour, Dusty, Mineral and Herbal notes. The Balance is quite good in fact. The Alcohol is nicely integrated as well. I would imagine that mainly Ex-Bourbon casks were used but I do get some Sherry notes as well. 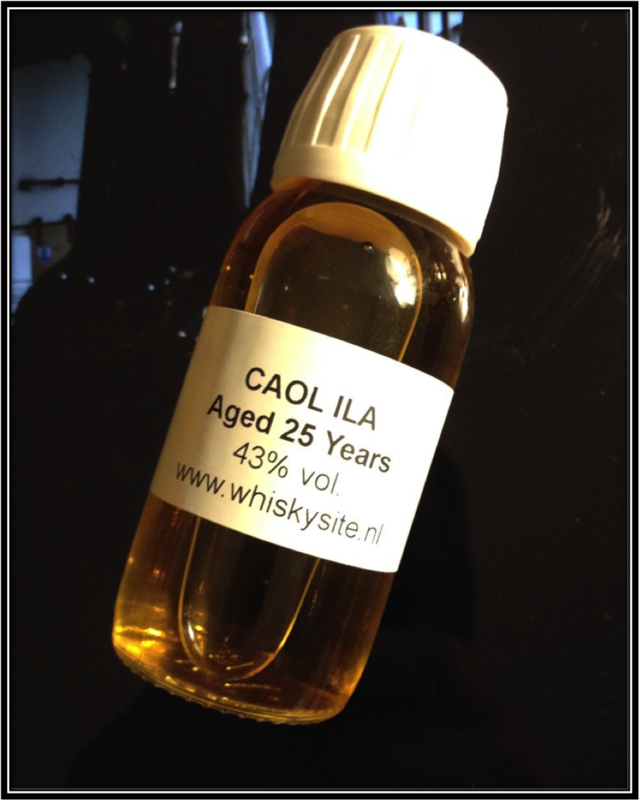 Despite its 25 Years, this Caol Ila is not heavy on the Nose. Elegant and Subdued are the best words to describe it. Not stunning but quite nice. I just left my "Tasting Room" for a moment and upon return I noticed a clear Aroma of Wood Varnish coming out of the glass. Strange I didn't notice that earlier. Palate: This Single Malt should have been bottled at at least 46%. I imagine though that it would be even better at Cask Strength. As it is, the Delivery is a bit on the Thin side. 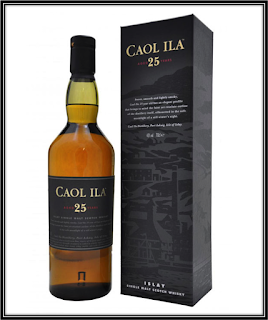 Despite this flaw, the Caol Ila 25 Years offers balance on the Palate with a good mix of Bitter, Sweet, Sour, Mineral, Herbal and Meaty Flavours. The Oak is there of course but it's not at all the dominant factor. I find Toasted Barley, Buttered Toast, Toffee, Caramel, Vanilla, Smoked Bacon, Fish or Shellfish, Soot, Tar, Ashes, Iodine, Grass, Apple Vinegar, Grapefruit, Pineapple, Sugar coated Almonds, Leather, Tobacco, Herbal Tea, Milk Chocolate, Pepper, Cinnamon, light Nutmeg, Ginger, Aniseed, Mint and a hint of Fresh Espresso. Finish: Long, Oily and Ashy with some Sweet, Bitter, Herbal and Mineral notes that are accompanied by some Spices. Dry towards the end. I find Sweet Barley, Smoked Fish, Ashes, Soot, Toffee, Caramel, Vanilla, Apple Vinegar, Grapefruit, Plum Jam, Tobacco, Leather, Charred Oak, Milk Chocolate, Pepper, Cinnamon, Nutmeg, Ginger, Salty Licorice, Menthol, Herbal Tea and some Fresh Espresso. The Caol Ila 25 Years does not improve with added Water. 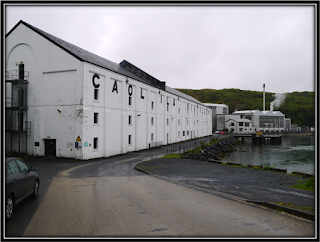 The Caol Ila Distillery was founded in 1846 and is located close to Port Askaig on Islay. It was bought by DCL in 1927 and through some mergers is now part of Diageo. The distillery was rebuilt in 1974 and only one old Warehouse reminds us of former days. Traditionally, Caol Ila is an important component of Blends like Johnnie Walker, Bell's and White Horse. 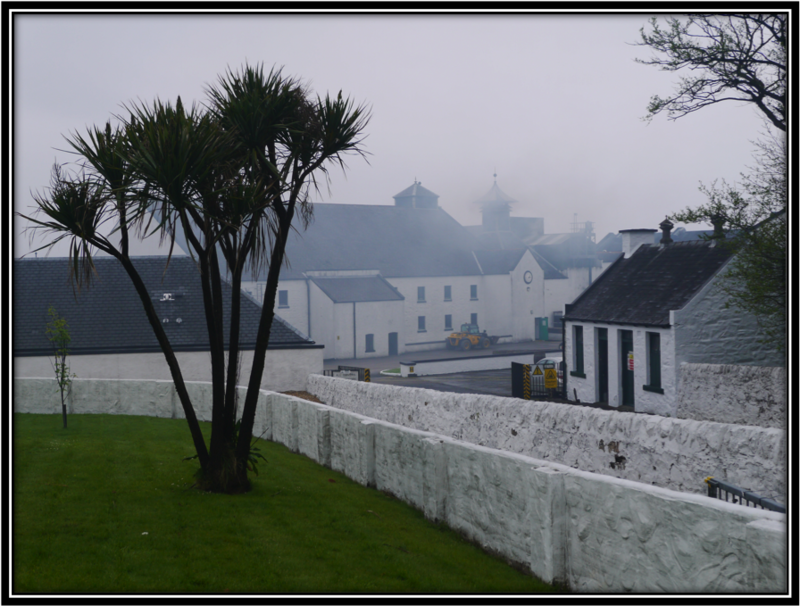 But during the last 10 years Diageo has made great efforts to position the Distillery as a Single Malt as well. Caol Ila is beautifully located alongside the strait between Islay and Jura. 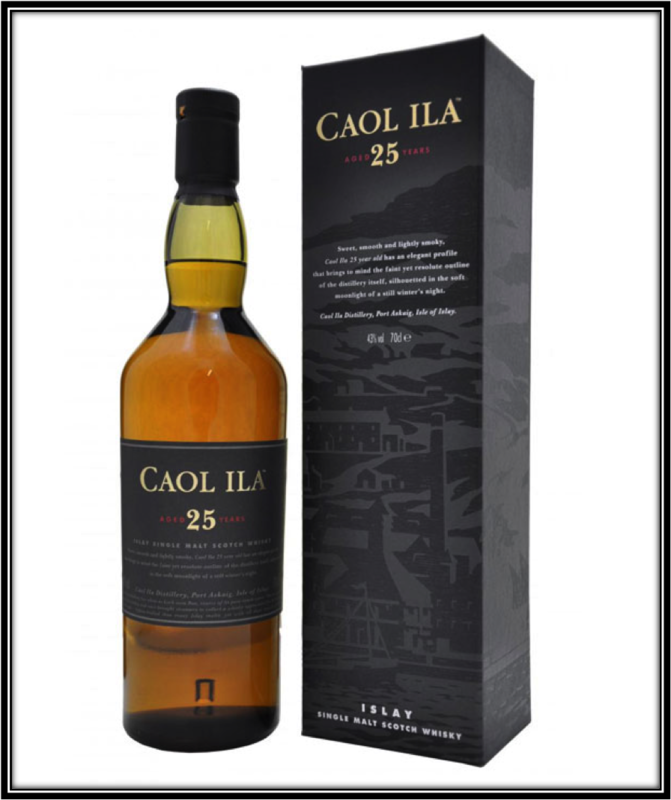 The first officially bottled Caol Ila 25 Years at 43% was launched in 2010 after two 25 Year old CS expressions were released in 2004 and 2005 respectively. The 25 Years is now part of the core range together a/o with the 12, the 18 and the NAS Moch. 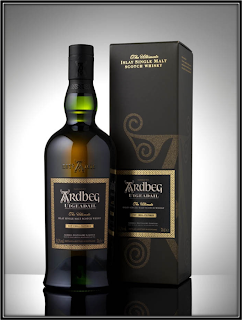 A 25 year old Vintage Single Malt is rare these days and it can't be cheap of course. Prices vary a lot depending on where you live but they are usually in the 140/200 US Dollar range (April 2017). Conclusion: The Caol Ila 25 Years is an elegant and well-balanced Single Malt. I really enjoyed the Tasting session. But it's also a lost opportunity to make a truly stunning Islay Malt. The ABV of 43% is simply too low. This Spirit would easily accept and in fact would truly shine at Cask Strength. In my opinion the price level of this Caol Ila would easily allow Diageo to bottle this Single Malt at a higher ABV or indeed at Cask Strength. There are only very few vintage Single Malts of this age around. The ones that are there should be Great, not merely Good! 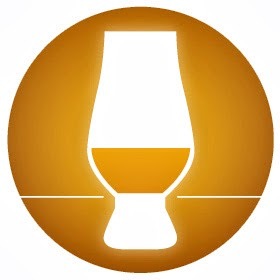 As a result of the above, the Price/Quality ratio for the Caol Ila 25 Years is unfavourable despite the fact that it is a very enjoyable Single Malt. How sad is that!